BSI arms fire fighters with the best possible tools before they start their dangerous work. Serving the fire truck industry has shown us that delivering every possible gallon of water to fire fighters is crucial when a fire strikes. We specialize in designing and fabricating custom tanks to the specifications of the given fire truck model. By focusing on the specs of each fire truck, we engineer custom tanks that let fire fighters utilize every gallon of water the tank can store. 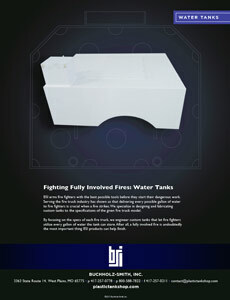 After all, a fully involved fire is undoubtedly the most important thing BSI products can help finish.